Rally racers is and still one of the most poorly represented genres for the Gamecube. It's kind of sad when there's only two true rally racers on the system, and both are ports of older PS2 versions. Pro Rally was the first rally game to come out for the Gamecube, but it's hardly new. It's basically a port of the 2001 PS2 title with 2002 slapped on. While it's true that the PS2 edition never made it to the states, it's pretty obvious it was a PS2 port. Especially in the texturing. Pro Rally is fairly standard in it's overall design, but kind of "dumbed down" when compared to WRC on the PS2, or to a certain extent, Dakar 2. You have very few, if any tuning options. This may be good for those who do not like to fumble with all the small details, but if you want to refine how your car reacts and optimize the settings for each stage, forget it. Your journey through the stages is also pretty much standard fare. You race in locales such as Spain, France and Argentina with varying conditions. The courses themselves are designed pretty well, and there are weather conditions. But then there are problems I have noticed within the stages. You can't go very far off course, or you will be automatically replaced. Also, there are some objects off course that I collided into that caused the game to freeze. Then there is the fact that your car almost comes to a complete stop when you hit another care. It's like you never really exert force on another object. I wouldn't have expected this amount of glitchiness in a game like this. The graphics are average. Blurry PS2 textures in most spots, and nothing ever really takes advantage of what the GCN can do. I bet if a developer actually designed a rally game specifically for the GCN, it would look excellent. But we have yet to see such a thing done. I think the best aspect of the graphics deals with the car models. They look fairly sharp and good. Not perfect, but much better than the background area. Here's a strange thing, though. At some areas, the entire background of the stage will flicker quickly. It's like for a split second, the entire area has been deforested. I'm glad that Ubi Soft actually provided music during the race. I can understand why some developers would leave music out during the race (it's so you can hear your co-pilot), but I would like to have the option to have music during the race. Here I do. It's not fantastic, but it's not annoying. Standard engine noises and collision effects round out the audio package. 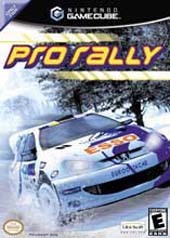 Overall, Pro Rally is a disappointment if you have played games such as Rallisport Challenge, V-Rally 3, WRC, Colin McRae 3, Shox, Rally Fusion and even Gran Turismo 3. I think the only ones who could enjoy this are the ones who only own a GCN and are very desperate for a rally game. Honestly, if off road action is what you want, buy Freekstyle or ATV2. If you want a racer with a lot of gameplay, get Burnout 2. If you own multiple systems, there's no need to bother with this. I'm just hoping one developer can give GC owners a good rally racer before the end of the system's lifespan. Nice try on bringing rally-sport to the Cube, but a late, busted port doesn't quite cut it. Honestly, there aren't many rally games I've played that are worse than this one.